An unexpected visitor is about to arrive with an unexpected gift ... Will it be something wonderful or woeful, rueful or romantic... or a little bit of everything? In the expert hands of four unsurpassed storytellers, "the season of giving" takes on an air of mystery. Get ready for a stockingful of shocking -- a potent holiday punch spiked with surprises, a hearty dash of romance and a twist of murder! The incomparable Christie Ridgway sends a shy, lonely teacher on a mundane pre-Yuletide errand that becomes the most daring, dangerous, and titillating adventure of her life. Award-winning mystery master Katherine Hall Page's plucky sleuth Faith Fairchild discovers a Christmas miracle that comes wrapped in deception. Judi McCoy's spirited career girl Claire St. Germaine receives a truly magical gift with very mysterious origins. 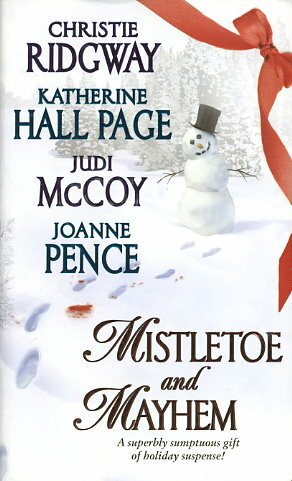 And Rebecca Mayfield, the delightful creation of Joanne Pence, discovers the hard way that Santa isn't always a saint.